You’ve probably seen unbelievable images, like the one above, race past on Facebook, Twitter or vKontakte during a breaking news event. Such images spread rapidly, virally, because the images are so gripping and seem to encapsulate what’s happening. Unfortunately, some of the images are hoaxes, others are recycled from previous events. As a journalist, it is important to make sure you don’t get overwhelmed during the heat of the moment and share or publish something before checking it out. We’re professional sceptics, and many modern journalists have found that a few seconds of scepticism have saved their credibility. We’ll look at some advanced image search techniques and services that will help you find the photos that you need in the deluge of UGCUGC (User-Generated Content)Content created by the public at large, generally not professionally edited,…//read more images during a big news event and also to uncover the fakes. 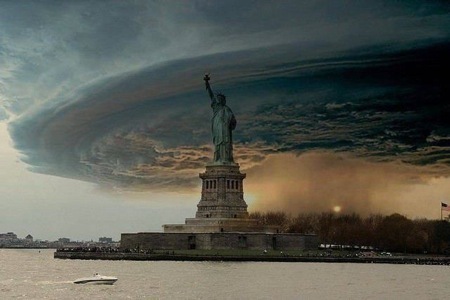 As Superstorm Sandy bore down on New York, the image above was shared by many of my friends on Facebook. I was sceptical. My first job as a journalist was in Kansas, in a region often referred to as Tornado Alley, and these clouds looked more like clouds from the thunderstorms I saw there rather than the type of storm that Sandy was. I saved the image from Facebook so that I could use Google Image Search to see where else online it might have appeared. Google Image Search allows you to search by keywordKeywordSpecific word(s) entered into a search engine by the user that result(s) in a…//read more , but you can also do a visual search, searching for images that are visually similar to another image. To do this kind of search, clickClickA click can denote several different things. It can be a metric that…//read more on the camera icon in the search form. This will bring up options to either paste in the URL, or web address, of the image that you want to search for, or to upload an image. 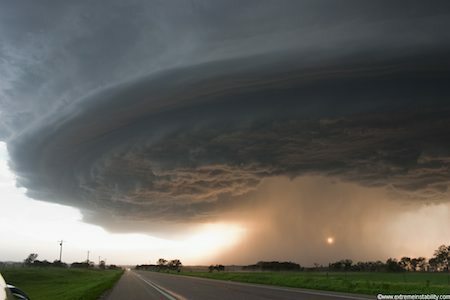 In this case, the search quickly led me to the original photo, which was taken in 2004 by storm chaser Mike Hollingshead in the state of Nebraska. Snopes.com, a site that debunks internet myths, said that this wasn’t the first time the photo had been used incorrectly. The original storm photo is a familiar one on these pages, as it (along with other examples of Mike Hollingshead’s work) has been circulated on the Internet numerous occasions as depicting a variety of different storms throughout the world, including Hurricane Katrina in 2005. The other value of a search like this is that it can show the other places where the photo has appeared. This can be valuable for verification and, as this example shows, help you locate the source of a photo as well. This will not only help you uncover faked photos, but can also help you find the original photographer if you want to use the photo. Also, as we saw in looking for Creative Commons images on Flickr, you can find out if a person is passing off a photo as their own. 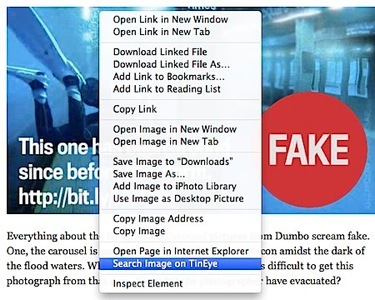 Tineye is another image search tool that news organisations are using to help find out where images are used, both to verify and to source images. Tineye works in a very similar way to Google Image Search. You can either upload an image, add a pagePageA document having a specific URL and comprised of a set of associated files. A…//read more URL or the URL of the specific image or simply drag and drop an image file on the page. Based on my experience with Tineye, it is best to upload an image or add the URL of the image, rather than the URL of the page. If we upload our Statue of Liberty storm image, TinEye finds 181 examples of pages where the image appears. It is pretty clear from these results that the photo is fake, with the second image being named “very-fake-hurricane-pic.jpg”. TinEye also has a range of browserBrowserA software program that can request, download, cache and display documents…//read more plugins, for Chrome, Firefox and Safari, so that you can right click on an image and it will allow you to search for that photo. For instance, on this story looking at sifting fake photos from real, and identifying photos that have been heavily edited, we can search for the photo that looks like a diver swimming through a New York subway station. The story from The Atlantic was one of many sorting fact from fiction, and it was one of the best examples of the kind because it provided sourcing information to back up its fact checking. There are a number of advanced techniques that you can use with both TinEye and Google Image Search to help you find photos, including photos with Creative Commons licences that you can use to illustrate your stories. Like all Google search services, Google Image search has a number of advanced options, many of which are available by clicking on the Search tools button after you’ve entered your search keywords. You can search by image size, by image colour, by time and even by type of image such as photo, images with faces, clip art images or animated images. There are other advanced search options which you can access by clicking on the gear icon in the upper right hand side of the page. Some of the additional options include being able to restrict your search to a region or to a specific website. One of the most useful options is the ability to search for Creative Commons licenced photos (the last choice in the advanced image search options). Google breaks down the Creative Commons licence into plain language. You’ll want to use the licences that allow for commercial use. Most of the images that the search will find will be on Flickr, due to its large collection of Creative Commons licenced photos, but Google will also find Creative Commons licenced photos elsewhere as well. 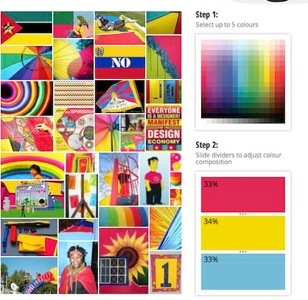 TinEye has a clever feature that will search Creative Commons photos by colour. You can choose up to five colours for your search, and it will show you previews of the images it finds. One thing to note though, you’ll have to click through to the photos to find the licencing terms to make sure that they have the appropriate Creative Commons licence. Image search has rapidly developed in the past few years, and now you can search not only by keywords but also by the image itself. It can be a great tool to help in verifying and tracing images. 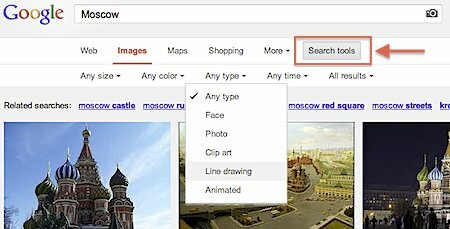 And advanced search tools such as Google Image Search and TinEye can also help expand Creative Commons searches beyond Flickr.